Early morning before work the other week I dropped by Uncle Mike’s Place, a breakfast place in West Town known for their famous Filipino breakfast, to try out two new dishes they had for a limited time on their menu. Both of these dishes included SPAM. And not just any old SPAM, the two newest jalapeno and black pepper varieties to be exact. My initial instinct when approached with writing about SPAM was to run for the hills. I’d never tried SPAM before, and had intended on keeping it that way, well for the rest of my life. But my sister asked me to humor her when said her client Hormel Foods was pairing up with Chicago restaurants to create new, flavorful dishes out of SPAM’s newest products. Chicago-born, Polish-Ukrainian chef of Uncle Mike’s Place, Mike Grajewski had already been serving authentic Filipino breakfasts featuring SPAM for nearly 20 years, so he was a natural when it came down to meeting Hormel’s challenge of offering an exclusive dish with SPAM’s newest flavors, Jalapeno and Black Pepper (they were released last year for SPAM’s 75th anniversary). 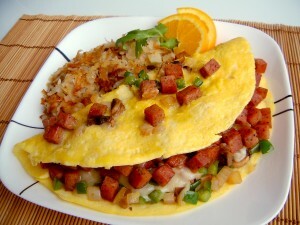 When I arrived, Mike had already laid out a whole breakfast spread including his limited edition dish, a Hawaiian plate that includes jalapeno SPAM, and an omelet with black pepper SPAM, mushrooms, green peppers, cheese, and onions. Blueberry-mango pancakes, bacon, skirt steak, and several other Filipino breakfast specialties awaited me when I sat down across from Mike and his beaming wife. I could tell they were anxious and excited for me to try the SPAM dishes and my sister already had done the honor of telling them I’d never tried it before. I looked down at the plate in front of me that Mike had so proudly prepared, a plate holding Jalapeño SPAM, seaweed, rice with a beautiful sunny-side egg on top, and a side pineapple with a thimble of sweet and sour sauce. I was about to try my hand at what I called “spam sushi”. First I took my piece of seaweed, coated it with the sticky white rice, poured a little bit of the sweet and sour sauce on top, and stuck a small piece of jalapeno SPAM right in the middle, rolled it up maki-style and without even counting to three popped it into my mouth. As my mouth and taste-buds clamped down on the first bite, my first thought was “wow I don’t hate this.” My second thought was “wow this actually is pretty good”. And by the time I swallowed I was already going for seconds. My SPAM sushi was a great combination of sweet, spicy, and sour. I'm going to say right now, the dish leans to more of the brunch side with the addition of rice; but was still tasty at 7am none the less. I think one of the reasons the SPAM dish I tried was so successful was because Chef Mike used it in combination with other flavors to make it a complete dish. That’s similar with all kinds of proteins as well! If you've ever tried a plain chicken breast with no seasonings, no olive oil, butter or a marinade, you'll know what I mean. I’d highly suggest you stop by Uncle Mike’s to try their new SPAM dish, as well as their other amazing breakfast options. 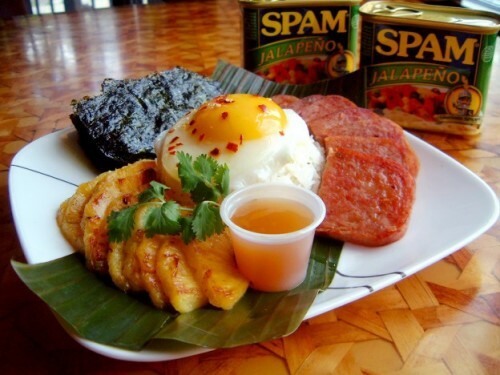 The limited edition SPAM dishes will be on the menu throughout the rest of the month of July. And lucky for you July is a 31 day month, so you still have eight more days to try it! Another cool thing to note- for every dish they sell, Hormel Foods will donate five dollars to the Greater Chicago Food Depository. If you’re more interested in SPAM on the side, I really loved their skirt steak, and their blueberry-mango pancakes! The skirt steak was marinated in a marinade that reminded me of the backyard bbq’s my family used to have growing up, it was such a treat to have it for breakfast and you better believe that I made use of the leftovers Mike wrapped up for us as well! If you go in and try the dish, comment on my blog and let me know what you thought!